The Best Little Record shop in South Texas. “We have everything from Edison records, 78s, eight tracks, cassettes, CDs and everything else you can think of,” said Tony Ramirez, owner of Frank’s Collection Record Shop. Ramirez has posters of Jim Morrison, The Beatles, Elvis and the movie “Medicine Man” up on the wall. Looking at Ramirez, he’s any music lover’s modern-day medicine man. He has the classic rock star look. And he has the songs to help music lovers looking for a vinyl record to take home to spin on the turntable and get lost in the music of their favorite artist with headphones or house speakers. “All the other modes of music have gone away except for records,” Ramirez said. Eight tracks came and went, cassettes came and went and CDs came and went, but vinyl records have always been there, he said. “Vinyl records never died. It’s Americana,” he said. Ramirez has been buying records since he was 10 years old and collecting them for the past 25 years, acquiring an expertise in albums along the way. He recalled one of his customers browsing the record shop and buying a Velvet Underground album just because the cover art by Andy Warhol was so impressive. When the King of Pop died in 2009, customers came in droves looking for deals on Michael Jackson records. People wouldn’t know walking through Harlingen’s downtown shops that Frank’s Collection was even on Jackson Avenue. The shop is named in honor of Ramirez’s brother Frank, who died in a car accident in 1983. It’s a reference to Frank’s coin collection. The store has crates and a wall of vinyl records totaling more 5,000 in every genre on sale for $5 and up, depending on the album and artist. The store is like a secret track on a CD or a lost song from anyone’s favorite artist. Many fans of vinyl know it’s there, but many others don’t know it exists. Finding the records is a must for local music lovers. “All of this music can be sold, it’s not junk,” Ramirez said. 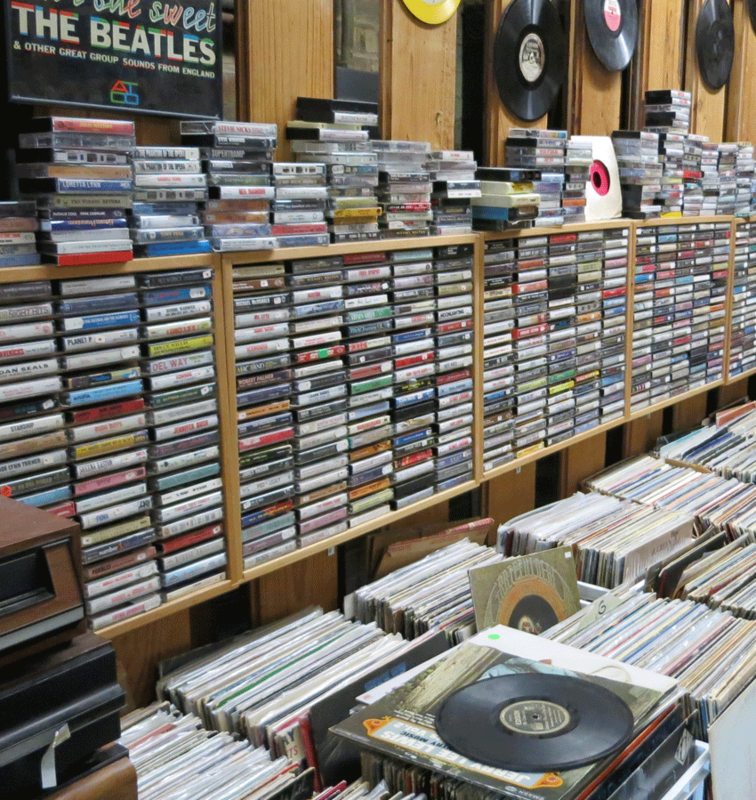 To get to the treasure of music, record lovers have to walk into The Antique Emporium corner store located at Jackson Avenue and Second Street and go all the way to the back of the store, where the music plays all day long. And just as Dorothy from the Wizard of Oz landed on the Yellow Brick Road, music lovers enter a world of music with some of the best contemporary songs ever recorded. The records are categorized by genre and are organized in alphabetical order. Ramirez said he has it all, and doubles of every album. 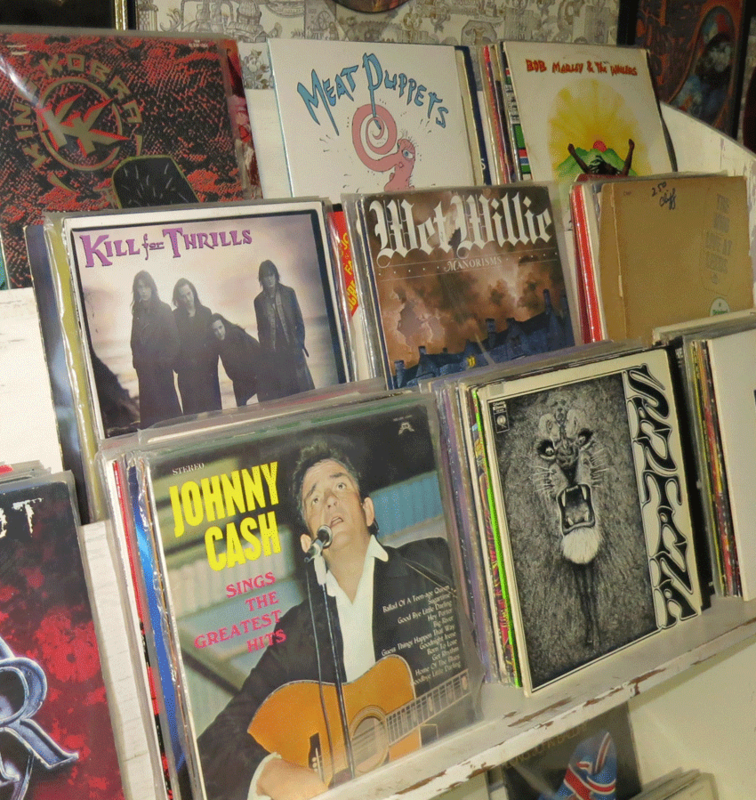 Just name a tune, and more likely than not Frank’s Collection has it, the store owner says. Tony Ramirez sits at a wooden table on the third floor of what used to be the Palm Hotel in Downtown Harlingen, overlooking Jackson Street. The third floor is equipped with a pool table, a bar and a smorgasbord of pop culture memorabilia. With a cigarette in one hand and a bottle of Shiner Bock in the other, Ramirez talks about the significance of Barry McGuire’s “Eve of Destruction,” how The Beatles’ mop tops changed rock ‘n’ roll and why he prefers the sound of a classic vinyl record over a CD any day. Having spent the past 50 years collecting records, Ramirez is a rock ‘n’ roll relic with expertise in classic rock that could arguably rival any modern music historian. He spent much of his life as an English instructor at the University of Texas at Brownsville, Texas A&I Kingsville and South Texas College, but also dabbled in disc jockeying and record collecting, finally retiring to open Frank’s Record Shop with his daughter Shannon. “He’s the beauty, and I’m the brains,” Shannon jokes. Ramirez and his wife June purchased the Palm Hotel nearly 20 years ago and converted the first floor into an antique shop and record store. They made the second and third floors their home. Shannon recalls the slow metamorphosis of her father’s collection from merely a fun project into something out of control. Tony’s shop is currently the largest vinyl shop in the Valley. He offers every popular musical genre you can think of along with CDs, cassettes, antique knives and coins. He began collecting records as a 12-year-old paperboy in the late ‘50s and early ‘60s. With the advent of CD players and cassettes, he said he spent much of the ‘80s in flea markets buying up the vinyl albums many people were abandoning. But he doesn’t blame vinyl’s demise on new technology. But Shannon begs to differ. Ramirez said he takes pride in owning a “mom-and-pop” store. He invites shoppers to bring in their own vinyl records to sell or spin on the shop’s record player. He spends much of his time chatting about music with customers and telling stories — like the one about how his copy of Marvin Gaye’s Soulful Mood met an untimely death on the floor of his house. The record was worth $800. Ramirez is also happy a new generation is discovering music through vinyl. He equates vinyl records with the stories and lessons passed on from generation to generation. “Vinyl records are memories. They were meant to last forever,” Ramirez explains.